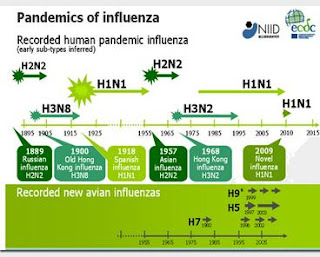 While we watch the avian H5 and H7 influenza viruses make tentative jumps to humans - and are justifiably concerned over their pandemic potential - as far back as modern science will allow us to look (about 125 years) the only influenza viruses known to have sparked a human pandemic were either types H1, H2, or H3. We've looked at the theory that Pandemic Viruses Are Members Of An Exclusive Club on numerous occasions, but the data is fairly limited. History suggests at least a dozen `influenza-like’ pandemics occurred in the 400 years prior to the 20th century, but we've simply no idea what subtypes might have been involved. We do know that the H1, H2, and H3 viruses are hosted not only by humans, but by birds, and a variety of mammalian species - including pigs. Also included are dogs, and horses, and even marine mammals. The assumption is that H1, H2, and H3 viruses of swine or avian origin likely have a smaller `leap' to adapt to humans than do the strictly avian H5 and H7 subtypes. And indeed, we saw that very thing play out with the 2009 H1N1 `swine flu' pandemic, which had been bouncing around North American pig herds for a decade or longer. “. . . virulent and can sustain onward transmission in pigs, and the naturally occurring mutations in the HA were associated with antigenic divergence from H3 IAV from human and swine’” and goes on to warn that ``. . . the potential risk of these emerging swine IAV to humans should be considered”. In recent years we've also been watching evolution of several swine variant viruses (H1N1v, H1N2v, H3N2v), all of which have reassorted with - and picked up the M gene segment from – the 2009 H1N1 pandemic virus (see Keeping Our Eyes On The Prize Pig). While an avian flu pandemic might be a lot deadlier, many flu researchers worry another swine-origin pandemic virus is more likely to emerge. All of which brings us to a new study published in the early edition of PNAS (Proceedings of the National Academy Of Science), where Chinese and Japanese scientists have isolated and characterized a number avian H1N1 virus variants circulating in Chinese pigs that they believe have considerable pandemic potential. Pigs are important intermediate hosts for generating novel influenza viruses. The Eurasian avian-like H1N1 (EAH1N1) swine influenza viruses (SIVs) have circulated in pigs since 1979, and human cases associated with EAH1N1 SIVs have been reported in several countries. However, the biologic properties of EAH1N1 SIVs are largely unknown. Here, we performed extensive influenza surveillance in pigs in China and isolated 228 influenza viruses from 36,417 pigs. We found that 139 of the 228 strains from pigs in 10 provinces in China belong to the EAH1N1 lineage. These viruses formed five genotypes, with two distinct antigenic groups, represented by A/swine/Guangxi/18/2011 and A/swine/Guangdong/104/2013, both of which are antigenically and genetically distinct from the current human H1N1 viruses. 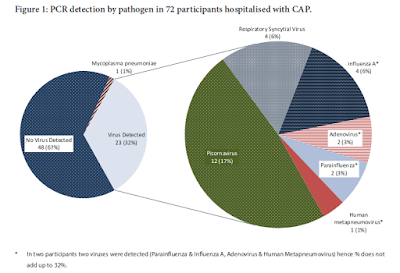 Importantly, the EAH1N1 SIVs preferentially bound to human-type receptors, and 9 of the 10 tested viruses transmitted in ferrets by respiratory droplet. We found that 3.6% of children (≤10 y old), 0% of adults, and 13.4% of elderly adults (≥60 y old) had neutralization antibodies (titers ≥40 in children and ≥80 in adults) against the EAH1N1 A/swine/Guangxi/18/2011 virus, but none of them had such neutralization antibodies against the EAH1N1 A/swine/Guangdong/104/2013 virus. Here, we found that, after long-term evolution in pigs, the EAH1N1 SIVs have obtained the traits to cause a human influenza pandemic. WASHINGTON, Dec. 28 (Xinhua) -- The Eurasian avian-like H1N1 (EAH1N1) swine flu viruses, which have circulated in pigs since 1979, have obtained the ability to infect humans and may "pose the highest pandemic threat" among the flu viruses currently circulating in animals, Chinese researchers said Monday. "Pigs are considered important intermediate hosts for flu viruses," Chen Hualan, director of China's National Avian Influenza Reference Laboratory, who led the study, said in an written interview with Xinhua. "Based on scientific analysis and comprehensive comparison of the main animal flu viruses: H1N1, H3N2, H5N1, H7N9, H9N2 and EAH1N1, we found the EAH1N1 is the one most likely to cause next human flu pandemic. We should attach great importance to the EAH1N1."